A luxurious two bedroom apartment nestled in the historic heart of Lymington. Situated minutes from The Quay and on the edge of the New Forest National Park. Smugglers Loft is a beautifully designed, bright and spacious apartment, forming part of a Grade II listed Georgian building. Access is through a pretty flagstone courtyard and has views up and down the High Street. The interior has been refurbished to a high standard but keeps the character and history of the building. Lymington is a bustling colourful town with plenty to see and do. Famous for its sailing, Lymington has two large marinas and two sailing clubs. The cobbled streets leading down to the quay are no more than two minutes walk away where you can buy fresh seafood and watch the boats sail by. The High Street has a fantastic selection of independent shops, boutiques, restaurants and bars. A well known Street Market, thought to date back to the 13th Century, takes place every Saturday and includes craft, local fine foods and antiques. The New Forest National Park is on Lymington’s doorstep – 150 square miles of heathlands and ancient woodlands where wild ponies, donkeys, pigs and deer roam free. To the West are four miles of coastal nature reserve ending at Hurst Spit which has received European and national recognition as a Site of Special Scientific Interest. • Grade II listed first floor apartment accessed from a quaint courtyard behind the High Street. • Newly refurbished and designed with a mix of modern and rustic vintage furniture - real attention to detail. • Free unlimited wifi and Netflix. • Large open plan living with sofa and armchair, large window seat, dining table with four chairs, HD TV, DVD player and Bluetooth sound system. • Elevated views up and down the Georgian High Street from the bay window seat in the living room – great for watching the world go by! • Modern kitchen area including Tassimo pod coffee machine, oven, hob, microwave, washing machine, fridge freezer, kettle, toaster, crockery, cutlery and utensils. • Large master bedroom with King sized bed, large wardrobe and chest of drawers. • Second double bedroom with small (4ft) double bed and small wardrobe. • Bedrooms have large double glazed sash windows overlooking the quiet courtyard to the rear of the building. Extra deep pocket sprung mattresses and quality high thread count cotton linen included. • Large bathroom including P-shaped bath with shower over, WC and basin. Towels included. • Central heating & double glazing throughout. • Outside space - shared courtyard with table and chairs for two. • We provide a free parking permit to be used approximately two minutes walk away. There are also parking bays outside the apartment for unloading luggage. The permit can also be used for free parking in approximately 30 car parks across the New Forest - great for exploring! 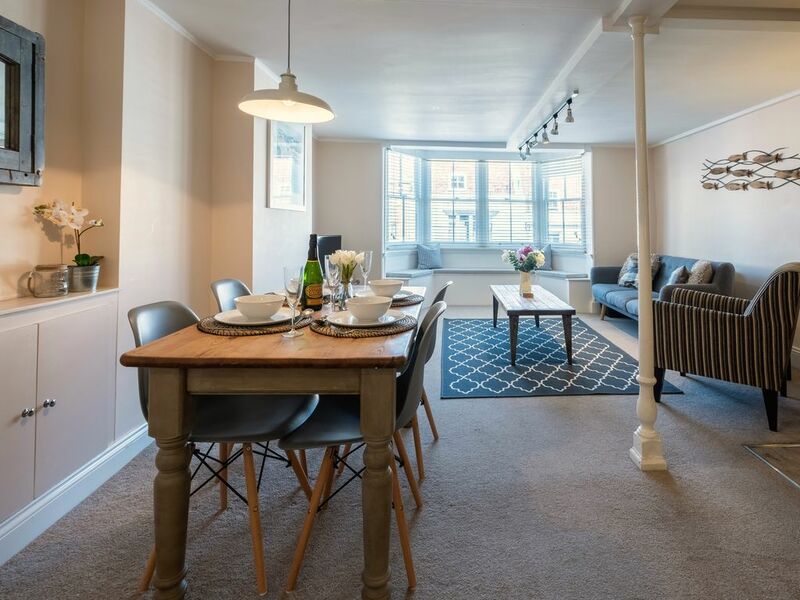 Our apartment provides the opportunity of staying in the heart of Lymington with all the conveniences of the historic High Street on your doorstep. The cobbled quay is a two minute walk away. Parks, coastal walks, a leisure centre and an open air swimming pool are also nearby. The location gives easy access to the beautiful towns, villages, wildlife and open forest of the New Forest National Park. •	Lymington train station (5 minutes walk away) is only one stop to Brockenhurst which has a direct service to London Waterloo (1.5 hours). •	Central London can also be reached by car in 1.5 hours. •	Lymington has a ferry port (car or on foot) for easy access to the Isle of Wight. •	Regular local bus services to nearby towns and villages. •	Beaches within 15 minutes drive. •	Please note there is no allocated parking at the property. We provide a parking permit Free of Charge - to be used approximately one minutes walk away (note £25 charge for lost permits). Parking bays outside the apartment for unloading luggage. •	Supplied Parking Permit can also be used in approximately 30 car parks across the New Forest - great for exploring! Hello! Claire and I and our two young daughters live nearby in the New Forest and absolutely love this part of the world - long walks along this magical coastline, coming across wild deer whilst exploring (getting lost!) in the forest, watching boats bobbing, long pub lunches, beach days, getting muddy wellies and making the most of some of the amazing places to see nearby. Our apartment is in the heart of Lymington - with views up and down the Georgian High Street and all its amenities on the doorstep but at the same time tucked away off a quiet courtyard. We love a day people watching from the large bay window seat, followed by something to eat in one of the nearby restaurants then a two minute walk down to the Quay to watch the boats. We can provide a parking permit to be used approximately one minutes walk away (note £25 charge if permit lost). Parking bays outside the apartment for unloading luggage. Choice of Coffee machine (Tassimo pod) or traditional coffee percolator. All crockery, pans, pots and utensils. Wireless bluetooth speaker - for use with your iPhone/ipad/laptop etc. Courtyard with table for two. Sorry, stairs up to 1st floor apartment not very wheelchair friendly. Had a relaxing break in a cosy , clean apartment. A bottle of Prosecco was left for us, which was nice touch. It is in a good location , few minutes walk to the Quay and plenty of restaurants nearby. David was friendly and good at communication. He gave helpful info on the surrounding area and the parking permit was very handy to use in Lymington and other car parks. Lovely place, fantastic location. We stayed here for a long weekend as a family of five (the fifth child being in a cot). We loved our stay and suspect we will visit again at some point. It is right on the High Street, extremely close to several takeaways, Tesco, and lots of other shops. The harbour is also really close. The parking pass is handy. Stayed for a week in this bright and well modernised apartment using it as an ideal base to explore the New Forest. Even though it is on the high street the level of external noise was very low - bedrooms are at the back of the property so very quiet. David was very friendly and helpful - with suggestions of places to go, where to eat, drink etc. Only suggestion for improvement (and I stress this is being picky) would be black-out blinds for the bedrooms as is was quite bright in the mornings - other than that I couldn't fault it. Smugglers Loft is a charming, welcoming, good looking flat right on Lymington High Street. Nice views up and down the High Street, particularly when the Saturday market is on; and walking distance to the harbour. Very easy to get to, both by train and car. Parking is easy with the parking permit the owners provide. The owners welcomed us with a bottle of Prosecco on the table, which was very nice. Wondeful property and fantastic location. We enjoyed our stay at smugglers loft so much we will going back again.